Chief Executive Officer – Hallmark Cards, Inc.
Donald J. Hall, Jr. is chief executive officer of Kansas City, Mo.-based Hallmark Cards, Inc. He also is vice chairman of the Hallmark board of directors and serves on the boards of directors for Crown Media Holdings, Inc., and Hallmark International. Hallmark is known for greeting cards and personal expression products sold in retail stores and online, as well as television programming through the properties of Crown Media Family Networks and Hallmark Hall of Fame productions. Hallmark also owns Crayola, the Easton, Pa.-based firm that inspires creativity in children through Crayola® crayons and other innovative art tools, crafting activities and toys. Hall, a grandson of company founder Joyce C. Hall, joined Hallmark in 1971 and has worked in manufacturing, customer service, product development, and sales. 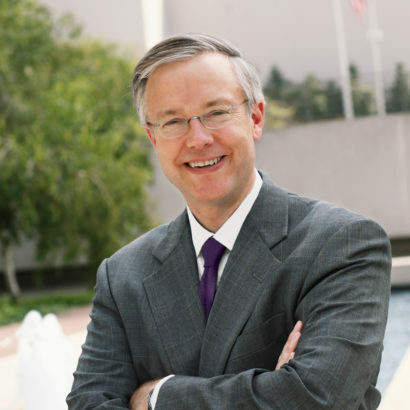 He has served as a member of Hallmark’s board of directors since 1990. In 1993, Hall was promoted to general manager of Hallmark Keepsake Ornaments, the company’s Christmas ornament brand. In 1995, he was named vice president of creative and became a corporate officer. Hall became vice president of product development in 1997, and in 1999, he was named executive vice president of strategy and development. He assumed the role of president and CEO in January 2002, becoming the third generation of the Hall family to lead the company. In 2015, his brother, David E. Hall, was named president; Dave now joins Don in leading all aspects of Hallmark’s portfolio of businesses. Hall is active in the Kansas City community as a member of the Nelson Atkins Museum of Art Board of Trustees, MRIGlobal Board of Trustees, University of Kansas School of Business Board of Advisors and the Kansas City Civic Council. Recognized for creativity, quality, innovation and brand leadership, Hallmark continues to expand both its product offerings and its distribution channels, today offering product and services in more than 30 languages available in 100 countries.